The first four days of our honeymoon were a blur. Our UK travel itinerary was packed. We landed in Edinburgh early in the morning, and set off on an adventure through the city. I fell asleep on a tour bus, and then we had to pull the car over to nap while driving to Glasgow. In Glasgow I courageously tried black pudding, and we drove hours and hours to get to Bath. Thermae Bath Spa was not quite what we expected. While it had nice views and we had a lovely dinner, it was crowded and not as exciting as we had hoped. The drive to and around Cornwall took much longer than expected, and we did not get to see all the things we had wanted. However, we did stumble upon old ruins, and visit the town my grandmother grew up in. Bath was a very walkable city, and visiting The Roman Baths was a highlight of our time there. Stonehenge was a let down, with large crowds and a confusing audio guide. Even though we almost missed our Harry Potter tour, we got to step onto the Hogwarts Express and feel the magic. We packed so much into our first four days, and had not even seen London yet! 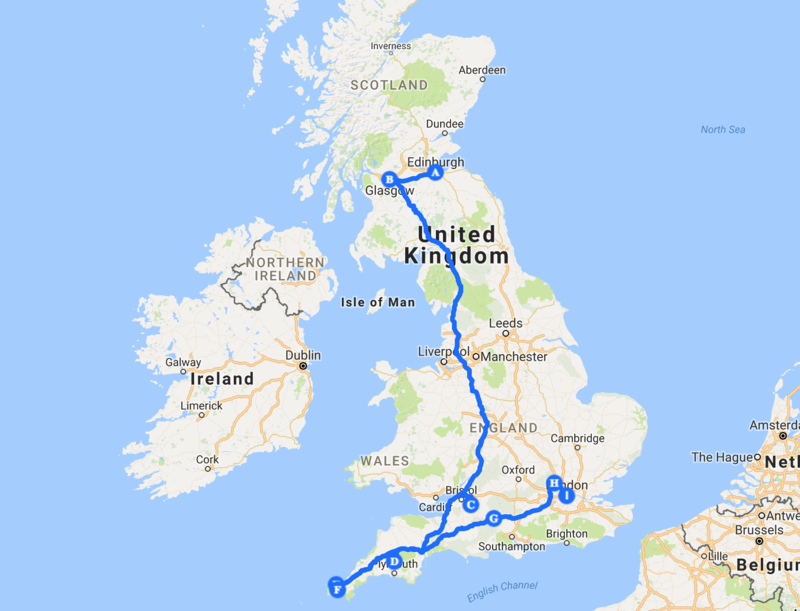 This UK travel itinerary was made with a few things in mind: it was our first time in the United Kingdom, it was our honeymoon, and we wanted to be able to have freedom to drive. Since it was our first time, a lot of things we decided to do were “touristy”. We visited Edinburgh Castle, we went to The Roman Baths, and we made sure to visit many of the main attractions in London. Because it was our honeymoon, we decided to add some romance to our itinerary. In Bath, we visited Thermae Bath Spa. We bought a package that included access to the pools, and all of the saunas/ themed rooms/ hydrotherapy. We stayed at Airbnbs throughout our entire honeymoon, and I cannot recommend the service more! Airbnbs are great for meeting locals, feeling at home, and getting insider tips on what is best to do and see in a city. If you sign up for Airbnb using this referral code you can get $26 CAD off of your first trip! We wanted to leave the cities, and travel from one place to the next on our own, so we rented a car. Our car was a 2017 Nissan, with many cool features such as a sensor to keep us in our lane (handy when you’re driving on an unfamiliar side of the road! ), and a GPS. We picked up the car in Edinburgh and dropped it off the night we got to London. Since we were always on the go and moving quickly from place to place, we ate most meals at restaurants. The exceptions were some of our breakfasts, which were provided by our Airbnb host in London. With Edinburgh Bus Tours, we took the Edinburgh route through the city. It was a great way to see main sights in a short amount of time, and we were able to stop at main points that interested us. The tour took much longer than expected, as we were stuck in traffic due to construction. I grew up reading stories about Greyfriar’s Bobby, a dog who supposedly sat at his owner’s graveside at this location until he himself passed away. There is a statue, a gravestone and you can tour the grounds, seeing various old and weathered gravestones throughout. There is also a bar commemorating the dog that we did not get a chance to check out. We stayed at an Airbnb that had a direct view to the Clyde River. The South Portland Street Suspension Bridge is lit up red at night and is a sight to see! Edinburgh; Lunch: We picked this restaurant to eat lunch at because it was a short walk from Greyfriar’s Bobby. I was set on having authentic British food, so I had their sausage & mash. After the waitress kindly explained to me what mash was (it is mashed potatoes), she let me pick from the over 12 kinds they serve. They even gave us Tunnock tea cakes (only one of the best British sweets ever!) with our receipt! Glasgow; Dinner: This was a very uninspired choice; after our day tour in Edinburgh we had driven all the way to Glasgow, and were exhausted and hungry. We picked this Italian food because it was a “street food” restaurant, which meant it would be quick and easy. I had a salad bowl filled with all sorts of things, which was light & yummy. The cannolis were the best! We picked up our car at Edinburgh Airport. Our first drive was into the city, where we parked near Waverly Station. This took approximately an hour, as it was morning rush hour and we took the wrong directions a few times. In the afternoon we drove from Edinburgh to Glasgow, which is about an hour drive. It took us about three hours, as we stopped mid-way at a gas station to nap, due to exhaustion (read about that here). We stayed at an apartment overlooking the River Clyde in Glasgow. Although we only had a private room, it was more than enough for us. We fell asleep at 7 PM, and slept for 13 hours straight. We took a self-guided walking tour through University of Glasgow grounds, which was founded in 1451! Highlights were walking through the quad, and picking up a whole bunch of merchandise at the campus bookstore. Adam Smith is a famous alumnus, and we purchased & then read Who Cooked Adam Smith’s Dinner?, a thought provoking way of looking at economics as a discipline that has historically excluded females. Bath, England is a town that is known for being home to authentic Ancient Roman Baths. Interested in more Roman ruins? Check out my time in Rome! Although those baths are no longer functioning, the town has a very well known spa that imitates what the baths may have been like. Although our reservation was at 7 PM, it was extremely busy. The open rooftop pool was crowded, but was so fun to float in due to all the minerals in the water. My favorite part was the Wellness Suites, which included steam rooms filled with essential oils, an infrared room, an ice bath and a sauna, among many other specialized areas. We purchased the Twilight Package, which included dinner and a glass of wine in their restaurant. Glasgow; Breakfast: We chose this place for breakfast as it was one of the only places open near the university. This was the place where I decided to try black pudding, without realizing what it was. We had a very English breakfast, consisting of eggs, ham, sausages, toast, beans, tomatoes, mushrooms & black pudding. It was very filling! Bath; Dinner: Having dinner in a robe after relaxing at a spa for an hour makes for a great dining experience. I chose a rose as my wine, and had the chicken breast for dinner. The food was amazing, as was the service! We drove from our Airbnb to University of Glasgow grounds (approx. 15 minutes), where we parked our car for the time that we explored the area. The drive from Glasgow to Bath was extremely long, taking approximately 7 hours with the stops we made. We filled our time with music and reading out loud. While in Bath we were able to walk everywhere, having our accommodation located centrally. We stayed in a house that overlooked the city of Bath. Again we only had a private room, but our hosts made us feel right at home. They had a dog and two cats, which made us happy as we were already starting to miss our puppies. Breakfast was offered each morning that we were there, and shared our first meal of the day with our host. This was the first town we stopped into on our Cornwall tour. My mom’s side of the family is from here, and I had been waiting many years to see the area. The church is located on the grounds of the town’s historical abbey, which was built in 951. The remnants of the cloisters are still standing, and we got to see them. The church that stands today was built in the 14th century and we toured around the inside. This beach town is located on the Western side of the Cornwall peninsula. Although we did not catch the nicest weather, the beach was beautiful to walk along. The town was filled with Cornish pasty shops, quaint stores and lots of things to do in nicer weather. Although we did not spend long there, it was a great experience. While driving from the West side of Cornwall to the East, we stumbled upon some ruins while driving. It was misty and rainy, and there was no one around. We spent at least half an hour exploring these old ruins, trying to figure out what they were. Although we later figured out they were ruins of an engine mine house, it was still one of the coolest things we did that day. Tavistock; Lunch: We had lunch here, and it was cold & rainy. We both ordered chilli with garlic bread, and loved sitting under the awning eating our food. St. Ives; Snack/ Treat: The Cornish pasty is the traditional food of Cornwall, and all of my life it has been considered a real treat for my mom to make them. Essentially it is a flaky pastry filled with beef, onion, and potato. It was my husband’s first time trying one, and it was so so yummy! Marazion; Dinner: It’s impossible to go to England and not have fish & chips! We got our fill in a town right next to the water, so it was definitely fresh and yummy! This day included a lot of driving: from Bath to Tavistock was approximately 3 hours, from Tavistock to St. Ives was another hour and a half, from St. Ives to Marazion ( St. Michael’s Mount) was about 20 minutes and back to Bath was another 3 and a half. If we could have a do-over, we would have spent more time in Cornwall. There is so much to see that it is overwhelming as a day trip. Since we knew we had a busy day ahead, we almost skipped The Roman Baths, the ancient baths which give the town its namesake. I am so glad we chose not to! Our entry ticket included an audio guide, which drowned out the noise of the crowds and we got to learn how exactly the baths worked. I would definitely recommend a visit if you are in the area! You can find examples of Roman ruins throughout my posts on Italy! This has an asterisk, because it is a “must see”, but was not one of my favorite attractions. The history of this area is foggy, and the audio guide was extremely unhelpful. While the stones themselves are pretty cool, it is a crowded bus ride to get there, and then a crowded visit around the stones. My favorite part was the sunny and clear skies, which made for some awesome pictures. We almost missed our tour here, getting stuck in London traffic on our way in. This tour was nothing short of amazing, not only because of the content (huge Harry Potter fan here!) but because it makes you appreciate just how much detail went into these films. Bath; Lunch: We chose to get Smashburger, American fast food, because we were in a hurry. We knew we did not have time to wait for food and slowly eat, so we grabbed the first “fast food” place we saw in Bath. I had the chicken burger with fries. London (Westminster); This was clearly a day of bad food choices. Nothing was open when we got into London at 10 pm. Shake Shack was just about to close, but not before we got our burgers and cheese fries. Recommendation? Do not get cheese fries from here! Our time in London was full of many mishaps. Read all about them in my post Unlucky London. We parked our car downtown Bath and walked to The Roman Baths. From there to Stonehenge was about an hour drive. Stonehenge to the Harry Potter tour, in Watford, should have taken us about an hour and a half, but due to traffic jams it took us closer to two and a half. From Watford to London was about an hour, and we dropped off the car in Westminster, London. We stayed in a room within a house which had many other people staying in it, and had a hostel vibe. It is across the river from Westminster. Before becoming an Airbnb, the space was a pub. It was a cool house, but it was quite hard to find, and it was too far from the main part of the city to walk anywhere. Our time in Edinburgh, Glasgow, Bath, Cornwall & Stonehenge flew by! Before we could blink, we were already in London, which is where we would finish up our time in the United Kingdom. Stay tuned next week for another UK travel itinerary covering our Two Days in London! Interested in my favorite places that I traveled in 2017? A Look Back provides an overview of a year’s worth of travel! Great blog! Thanks for sharing the tips and your itinerary. Hoping to do this as soon as possible. Thanks for sharing ♥️ ♥️ By any chance you are interested on doing collaborations, you can check out the collaborations portal of Phlanx.com and connect with amazing brands! Thanks so much for reading it! I will check out the collaborations portal! That is one packed honeymoon! I studied abroad in the UK in college. We climbed to the top of Arthur’s Seat, and I loved Bath! Wonderful trip! I need to go back and do the Harry Potter Tour. I was there pre-Harry Potter craze. Well, maybe the first two books were out, I think. I’m old. Haha, the Harry Potter tour is super new (they only opened up the studios a few years after the last film was released). It is definitely worth it to see the studios though! Our honeymoon was super packed and I probably would not do that much in such a short time again, but it was a great experience! That’s the most detailed guide I ever saw! Would love to explore UK more, I’ve only been to London and loved it. Thanks so much, that is awesome to hear! The UK has so much more to offer than London, I hope you can return soon! What an incredible trip! I love England and have traveled to Bath and The Cotswolds and a few other areas. I would love to do a driving tour soon. Bookmarking your post for future reference. Driving through is such a great way to experience. I would love to visit The Cotswolds when I return! Hope the info is helpful to you when you return!!! Really loved your organization of presenting your travel itinerary here. It helped a lot in following along. Sounds like a crazy trip with so much rich culture packed in. Thanks so much! There was definitely a lot packed in and it was a bit exhausting, but well worth it! Oh wow! Your itinerary was packed! And here I thought my trip to Ireland was stressful since I went to 3 cities in 7 days, and did 1 day trip to Cliffs of Moher. Packed it was! That sounds like a lovely trip, I am hoping to make it to Ireland soon! Your trip looks amazing! I’ve been to Ireland, but the rest of the UK is on my bucket list! I love that you included details! Thanks so much! Ireland is apparently super beautiful so I would be interested to see how the rest of UK would measure up. There is so much beauty in that area! I like the frank and direct way in which you have listed out your experience. Reading your blog would be very useful for anyone visiting the same locations. I would probably go to all the touristy places as well if I’m visiting a place for the first time. Moreover, I also find Hop on Hop off tours a great way to see any city. Thanks! The Hop On, Hop Off tours are definitely a great way to get the feel of the city and figure out what exactly you would like to see. I am happy you found it useful! This is very well organized. I am mainly interested in checking out these historic castles. The castles are the best part. My only regret is that we did not get to see more castles! Samantha, it’s a great pity you did not put in your itinerary Oxford and Cambridge. Two splendid cities with a typical English “university” scent. Two cities that “vibrate so much peace and European balance”. They are relatively close to London and deserve a little sacrifice to be seen. I would have loved to see them, and we are hoping to return to see much more of England! As a Brit, I used to always wonder why people would travel from afar to visit the UK. But this looks like you had an amazing time- I’ll have to make it to Bath and Stonehenge some day. I think everyone feels that way about their country! I feel like that about Canada but traveling abroad I hear so many people excitedly tell me about their time in my country. Perspective is everything! I would recommend Bath, it is so so so cute! Yes! I would love to return to Edinburgh as one day was much too short. You should check out other parts of England, London can be a bit overwhelming but the small towns are so quant and cute! We just went to the UK last year and Scotland was by far my favorite, but we didn’t make it to Edinburgh. I’d love to go back and see it. Your trip looks like it was a fantastic adventure! I hope you go back to Scotland to see Edinburgh, it is such a pretty city! Thoroughly written and with great value. I’ve set my sights on Scotland for a long time. Thank you so much, I’m glad you enjoyed it! Scotland is definitely an awesome place, I wish we had the chance to explore more of it! Lovely trip! It seem you are covering all the best of UK. 4 days though, isn’t it too fact? In summer I made the whole Norway from North to South, and it took me almost a month. You’re definitely right. We had three weeks and we wanted to see Great Britain, France and Italy so we packed out itinerary full! your tip looks like it was a great time! I would love to drive through the UK someday and I’m dying to do the Harry Potter tour! It was such a cool tour! Driving makes it a totally different experience, here’s to hoping you get there soon! I´ve never been to Eddinburgh but I could totally recommend going to Cotswolds. We only learned about that area afterwards! When we go back we would love to visit there!! !